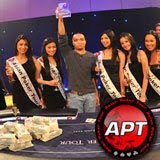 25-year-old Neil Arce sent the local crowd wild with delight by taking down the 2009 Asian Poker Tour Philippines. Arce conquered a field of 262 runners representing over 40 countries to scoop the first prize of US$185,000. The runner-up was Steve ‘joonhee’ Yea from South Korea who also finished second at the 2008 Asian Poker Tour Macau in August 2008. Leading Tournament Director Matt Savage oversaw the action in the $2500 + $200 Main Event which had a total prize pool of US$635,500 with 27 places being paid. First out on the nine seat final table was Kim Tae Hyung from South Korea, followed by Finland’s Vesa Leikos. Glamorous US pro Liz Lieu went seventh, followed by fellow American Ron Kluber and Japan’s Susumu Toge. Cicurel Didiwe from the Seychelles finished fourth and US pro Kasey Castle in third. When it got heads-up Yea held the chip lead with 1,572,000 to Arce’s 1,048,000. Notable cashes in the event include 12thplace for Nam Le and 13th place for his fellow member of The Poker Pack Steve Sung. Australia’s Michael Pedley finished 10th and Matchroom Sport Director Eddie Hearn cashed in 16th. Amongst those who were in the hunt for the title included Nam Le, Quinn Do, David ‘Chino’ Rheem, Steve Sung and Kwang Soo Lee – all members of the Asian Poker Tour’s elite team of ambassadors - The Poker Pack - who are currently in storming form on the international live circuit. They joined a field that also included 2008 Asian Poker Tour Philippines winner David Saab, 2009 Aussie Millions Highroller event winner David Steicke, Michael Pedley, 2009 PartyPoker.com Irish Poker Championship winner Rory Rees Brennan, Brian Huang, Ivan Tan, Andrew Scott and 1990 WSOP Main Event winner Mansour Matloubi. The Philippines was strongly represented in the field including WSOP bracelet winner Toto Leonidas. There were big contingents from South Korea and Japan, with 2008 Asian Poker Tour Philippines runner up Chris Roh and Yea leading the charge for South Korea and representatives from JBetPoker, Team J3PT and the Japan Poker League making up a formidable Japanese contingent that included Yasuhiro Waki and Yoshei Watanabe. The Asian Poker Tour Philippines is drawing to a close and has been running since the 27th January. Amongst the side event winners are Henrik Eklund of Sweden who took down the PKR Headhunter tournament and Francis Uy of Manila who emerged victorious in the Ray Ban Invitational. Tommy Le followed his recent impressive Aussie Millions cash by taking down the 13 Card Tournament side event at 2009 Asian Poker Tour Philippines. Quinn Do, a member of the Poker Pack was on the final table of the DafaPoker Pot-Limit Omaha Hi tournament and gave 50% of his winnings to charity. A special Filipino Celebrity Charity Event also took place and was won by ‘The Playgirls’ who won 100,000 pesos for charity. Over 200,000 pesos in total went to various local charities. The FHM/DafaPoker Player’s Party took place on the Saturday night and the famous Asian Poker Tour hospitality resulted in a massive poolside party hosted by FHM cover models that went on well into the night. Down in the poker room there was a 13 card tournament.